This river, although interesting, is not worth going out of your way for. If you are in the Pucon area and more specifically up near the headwaters of the Liucura near the “Los Posones” or Termas de Huife hot springs you might want to check it out. To get to this stretch first find the takeout which can be reached by driving past the Termas De Huife for another 2 KM until you cross a bridge over the small Llancalil creek. This is the takeout and is at approx 640 meters elevation. To reach put in back track road about 1/2 km past Termas de Huife and turn left. You will climb a steep road and pass Lago Huife. Continue another 2 km or so until you find a farmers road peeling off to the river. We got lucky and found one that took us almost to the river. We asked permission of farmer to leave our vehicle and we walked our boats down to the trickle of a river. Here it is about 750 meters elevation and you begin to scrape your way down about 2 km to where the discharge of Lago Huife significantly bumps up the flow. From here in the final KM the river drops close to 70 meters of 350 FPM to the takeout. There are several portages none of which are very difficult. 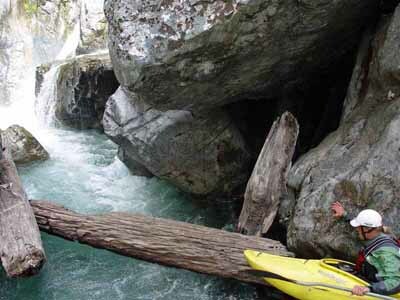 Again this creeky run is more of a novelty that quality whitewater and is best left to those that have time and like to explore….